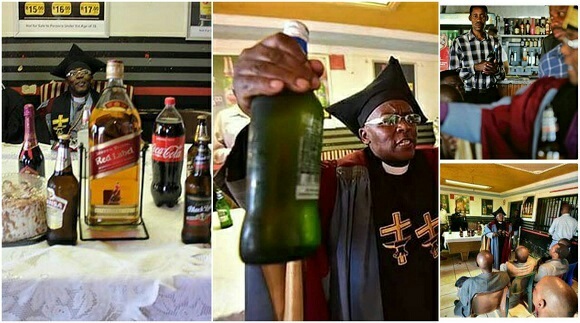 A Church in South Africa is currently trending after it's unorthodox way of baptizing it's faithful with their favourite alcoholic drink instead of water surfaced. 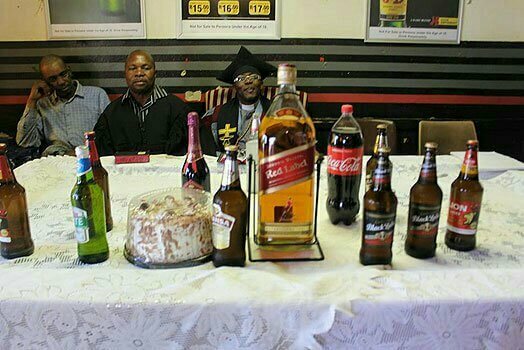 That's not all, the congregants at the Gabola Church have also been given a go-ahead to drink alcohol during church services. 52 year-old Bishop TsieTsi Makiti, is the founder of the Church and is the brain behind the idea. 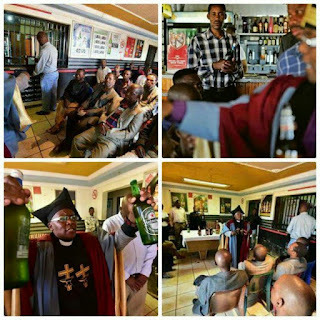 It's name 'Gabola' is the Tswana word for drinking, there is only one branch at the moment but the Bishop is looking forward to expanding it further. Due to the beer baptization, Bishop Makiti's Church has witnessed it's membership rocket to over 500 members in just under 'Two Months'. He says he was motivated by the scriptures narrating how Jesus changed water to wine. He added; people who drink and get baptized by beer are happy and peaceful. This means they are living in the Shadow of God. The Church accommodates people who are not welcomed at other Churches.